Ssangyong Rexton 2.2 EX 5dr Auto 2019 Review | What Car? What Car? will save you at least £286, but our approved dealers could save you even more. 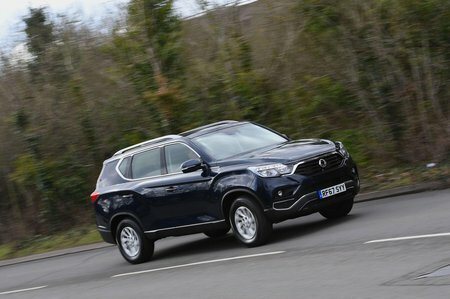 It may be the entry point in the Rexton range, but EX cars still get four-wheel drive, auto lights and wipers, seven seats, keyless entry, an 8.0in infotainment system with a DAB radio, Bluetooth and Apple CarPlay and Android Auto, air-con, automatic emergency braking, lane-keep assist and 17in alloy wheels. The only engine, a 2.2-litre diesel unit, has 179bhp and 295lb ft of torque that are enough for adequate performance. It’s refined for the most part but does get shouty when you rev it hard. Four-wheel drive is standard and you can choose a six-speed manual or seven-speed automatic gearbox.